An article from the mainstream media in South Africa on escalating political violence including assassinations, police murders and violence from local party structures. On Monday evening, not long after the sun went down, a man with a gun stepped out of the dark and into the everyday domestic routine in Thuli Ndlovu’s home in KwaNdengezi, Durban. He shot Ndlovu seven times, and her neighbour’s teenage son twice. Ndlovu died on the spot. Her neighbour’s son is in a critical condition. Ndlovu was the chairperson of the KwaNdengezi branch of Abahlali baseMjondolo. Like Nkululeko Gwala, a member of the same organisation, who was assassinated in Cato Crest, also in Durban, in June last year, she had been subject to serious intimidation for some time and had told her family and comrades that she expected to die. Abahlali baseMjondolo is not alone in having to confront political assassination in this part of the country. In August this year three members of the National Union of Metalworkers of South Africa (Numsa) were assassinated in Isithebe, an hour’s drive from Durban. In March last year Thembinkosi Qumbelo was assassinated in Cato Crest. He was involved in the same struggle against corruption and for land and housing, including a high profile land occupation, that cost Gwala his life three months later. But Qumbelo had joined the ANC in 2011 and was engaged in contestation with the local party structures from within the party. People have also been assassinated as a result of conflicts within the ruling party as well as rivalry between it and the Inkatha Freedom Party and the New Freedom Party. A study by David Bruce published in September last year found that there have been at least 450 political assassinations in South Africa since the end of apartheid, the bulk of them in the province of KwaZulu-Natal. Bruce concluded that political assassination has become “a sustained feature of political life in South Africa, particularly in KwaZulu-Natal”. People involved in grassroots struggles are also at risk of being killed by the police. In September last year an unarmed teenage girl, Nqobile Nzuza, was killed with a shot to the back of her head by a police officer while participating in a protest organised by Abahlali baseMjondolo in Cato Crest. At least forty three people have been killed by the police during protests around the country during the last ten years. This figure doesn’t include the thirty seven striking miners killed by the police in August 2012. In Marikana it was shots fired at striking miners from the local office of the National Union of Mineworkers that began the violence that ended in the police massacre. In Durban there have, since 2009, been a number of cases where members of the ruling party have attacked people organised outside of the party. In some cases there has been explicit sanction for this kind of violence from the party’s leaders. 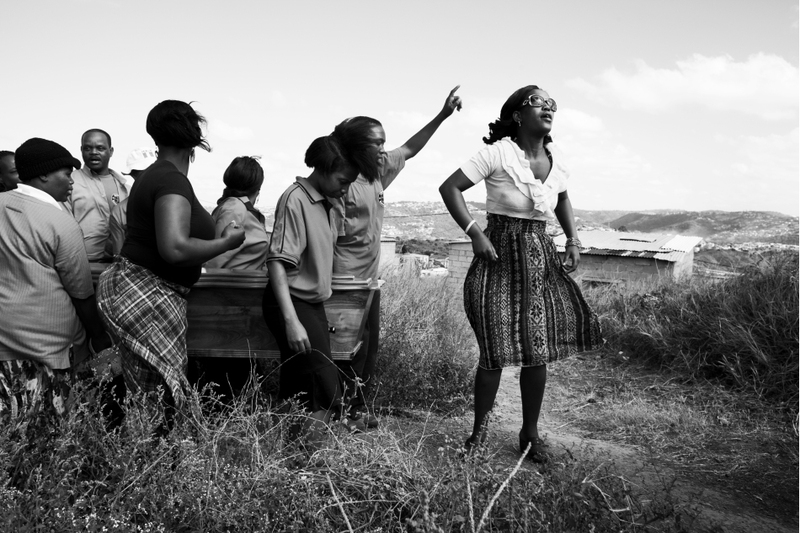 In 2009, when members of Abahlali baseMjondolo were attacked by members of the ruling party in the Kennedy Road shack settlement in Durban, Willies Mchunu, a Minister in the Provincial Government, declared that the settlement had been liberated. Last year some media attention was directed to the speech given by Sibongiseni Dhlomo, chairperson of the ANC in Durban, which was understood in some quarters as having given official sanction for the assassination of Nkululeko Gwala four hours later. But nothing was made of the fact that Dhlomo also responded to militant protests against corruption and eviction in the same area by urging what he called ‘the community’ that they should not “rely on police, but be protective of this area”. In recent days Abahlali baseMjondolo have reported that in both Cato Crest, and Lamontville, ANC members have arrived, backed by the state’s armed forces, to demolish their members’ homes. The Municipality in Durban, like others around the country, has a long history of sending in armed men to disconnect people from water and electricity and evict them from their homes. These actions are routinely unlawful. In April last year, after a series of evictions carried out in Durban in violation of both the law and court orders, the Socio-Economic Rights Institute declared that eThekwini Municipality had gone ‘rogue’. These actions are also often extraordinarily violent. In October last year two residents of a shack settlement in the suburb of Reservoir Hills were killed, and another seven injured, during an armed electricity disconnection. But it’s one thing for a state to act unlawfully and violently. It’s another thing for a state to encourage members of the ruling party to attack people organised outside of the party. For anyone who lived through the civil war that wreaked so much destruction across what is now KwaZulu-Natal in the last years of apartheid, or grew up in its aftermath, this shift to the mobilisation of horizontal violence against grassroots activists is all too familiar. In the late 1980s the apartheid state, confronting a growing urban rebellion, and finding the legitimacy of its own capacity to exercise violence under sustained critique, armed and supported the Inkatha to attack anti-apartheid forces. A good number of the people who have ascended to power in the ANC in KwaZulu-Natal cut their political teeth in the resulting civil war. Some, like John Mchunu, who was the chairperson of the ANC in Durban from 2008 till his death in 2010, had been with Inkatha during the war. After his death the Mail & Guardian described Mchunu as having been an Inkatha “warlord” in the 1980s and, as head of the ANC in Durban, as a “Chicago-mob kind of character, establishing a system of economic and political patronage in local politics”. It is, in the main, in defence of this system of economic and political patronage that assassination is becoming an increasingly common part of political life in Durban and the province of KwaZulu-Natal. But with popular protest having escalated over the last decade to the point where dramatic images of protestors confronting an increasingly militarised police force from behind burning barricades are a regular feature of the evening news, there is also a growing sense that the ruling party’s long hegemony is under real threat. Land occupations, road blockades and, when it is effective, resistance to housing projects understood to have been subordinated to the political and pecuniary interests of local party structures, strike real blows at the party’s capacity to monopolise the exercise of certain forms of power. Numsa and the Economic Freedom Fighters (EFF) are both making serious attempts to capture the discontent that is animating the popular ferment rolling through our cities. Numsa’s strength lies in the fact that it is rooted in a union that has real organisational strength. But, at the moment, it’s stolid discourse and rather flat footed response to an escalating social and political crisis doesn’t bode particularly well for aspirations to make significant political interventions beyond the shop floor. It is the EFF that have, with a real gift for the politics of spectacle, stormed the media and begun to position themselves as a serious rival to the ANC. The EFF has certainly captured much of the political space in Marikana. But Marikana has become bigger than the miner’s struggle that turned the name of a place into the name of an event. In Durban and in Cape Town tenacious struggles are being waged over land occupations named for Marikana. But despite all the contestation on the part of new entrants into the sphere of elite politics aiming to capture the political energies being organised from below neither of the chief contenders have, thus far, really connected with the issues, sentiments and organisations driving actually existing forms of popular politics in our cities. A politics organised for socialism or against white monopoly capital and for the restoration of rural land remains at some remove from the immediate urgencies of the urban land occupation. In Durban Abahlali baseMjondolo has been more effective than any other organisation in winning the support of people engaged in struggles for urban land and housing and against forms of development resulting in dispossession or mediated through systems of patronage organised through the ruling party. In Cape Town it is organisations like SANCO and Ses’Khona, both directly linked to the ANC, that are at the forefront of these struggles. As a result of the tenacity of their protagonists, and the access that organisations like Abahlali baseMjondolo and Ses’Khona have won in the elite public sphere, these struggles are slowly seeping into a wider national political consciousness. But in general the middle classes haven’t shown much interest in assassinations or murders that take the lives of poor black people in places where the middle classes, white and black, fear to tread. They should take heed of Aimé Césaire’s observation, made in 1955, that colonialism has a ‘boomerang effect’ – that what is done over there, to them, will eventually be done here, to us, at home. In a country like South Africa, in which the logic of colonialism continues to structure social relations in many respects, the ‘over there’ is the other side of town rather than the other side of the world. If assassination, murder at the hands of the police and the mobilisation of armed party members against popular struggles continues to be carried out with impunity in Durban a moment will come when the middle classes have a lot more to worry about than how Jacob Zuma responds to Thuli Madonsela’s report on Nkandla.